It is an exciting time for community college reform. The 10 finalists for the 2019 Aspen Prize for Community College Excellence—a $1 million award given every other year to the country’s best community colleges—are working at the leading edge of a movement aimed at improving student outcomes in the key areas at the center of the Aspen Institute’s definition of success: learning, degree and credential completion (at community college and after four-year transfer), and the labor market, achieved equitably for different student groups. Through these colleges’ exceptional efforts, the Institute has learned a great deal about the thoughtfulness and persistence required for deep, transformational change on behalf of students. We’re seeing smart, institution-wide reforms in a range of internal systems, from clarifying program maps to focusing advising to improving faculty professional development. Colleges are strengthening relationships with K-12 systems, universities, employers, and community-based organizations. As we learn more about what’s working in the field, we translate lessons about reforms into practical reports, assessment tools, curriculum, and convenings for college leaders, aimed at helping more community colleges achieve high and improving levels of student success. While reform efforts involve common strategies, the design of those strategies varies substantially among finalist colleges. Leaders at each institution work to understand their communities and craft reforms that respond directly to why change is essential there. Too few young adults receive a college education. Too few unemployed (and underemployed) adults receive the formal learning needed to improve their station in life. Too many good jobs remain unfilled due to inadequate numbers of trained workers. Too much talent is left undeveloped—disproportionately among communities of color and those with the fewest resources. At excellent community colleges, a deep-rooted sense of place and purpose drives reforms. Their leaders, faculty, and staff start with the where. They are unusually effective with the what (strong reform models) and the how (effective delivery). But perhaps what distinguishes them most is their consistent effort to keep everyone at their colleges focused on the why: They are dedicated day in and day out to finding the best ways to foster social mobility for their students and develop talent for their communities. For too long, community college students have been left to craft their plans with inadequate guidance and support. Sure, advisors and faculty have been there to help, but even they can be confused by the options — which can include more than 1,000 courses at larger community colleges. More and more schools have come to realize that this “cafeteria approach” is a central reason students drop out, and are developing clear course pathways for students from matriculation to graduation. Many colleges have adopted guided pathways in the past few years, but for some Prize finalists they’re nothing new. Every program at Prize finalist Mitchell Technical Institute in South Dakota has long had clear maps of courses and defined learning objectives. The result: a three-year graduation rate of 67 percent, over twice the national average. These colleges understand that students will fall off even the most well-designed pathways if they don’t have a range of supports. Most Aspen Prize finalists have paired clear program maps for all students with strong advising systems to support students along the way—an approach that has contributed to steady climbs in retention and graduation rates at Broward College, Indian River State College, and Miami Dade College in Florida as well as Palo Alto College and San Jacinto College in Texas. While some colleges are so large that they need to sequence their reforms of program maps and advising systems, Palo Alto College restructured program maps and a thoughtful case-management advising system for its 10,000 students at the same time. Leaders realized that it would be a huge challenge for advisors to help students select a program of study and stay on course if they each counseled 1,000 students, so they reallocated resources to reduce caseloads to 350 students on average. The result: An 11 percentage point increase in the graduation rate over five years. Aspen Prize finalist colleges understand that students will fall off even the most well-designed pathways if they don’t have a range of supports to address their nonacademic needs. Kingsborough Community College in New York and Miami Dade, large colleges in major metropolitan areas, have developed robust support systems that include Single Stop centers, where students can find a range of assistance — from tax preparation to public benefits to transportation vouchers — all in one place. Pierce College in Washington works to connect students to resources, too; people throughout the college also work intentionally to lift systemic barriers to student success, including by removing fees and deadlines, revisiting attendance and residency policies, and simplifying enrollment and financial aid. Palo Alto surveys students to identify their biggest pain points, targets interventions accordingly, and assesses students’ stress levels before and after to make sure the efforts are making a difference. These supports are likely one reason why these colleges have steadily increased retention rates while many other community colleges have struggled to keep students from dropping out. Exceptional community colleges understand that if they are truly to improve opportunity, pathways must be designed to connect students to what comes next in their lives. So their workforce programs are specifically aligned to the needs of their local economies and good job opportunities for students. Along the Treasure Coast of Florida, Indian River runs some of the nation’s leading laser technology and energy programs, as well as remarkable continuing education for law enforcement officers and first responders. Located in the heart of Texas’s gas and oil country, Odessa College and San Jacinto run excellent programs in drilling and petrochemical processing. (Dow and BASF are collaborating with San Jacinto to codevelop a state-of-the art petrochemical processing plant that a leading industry magazine says will “change the face of how … key technicians of a plant are educated and trained.”) Mitchell has an exceptional precision agriculture program that’s aligned to regional needs, while Miami Dade’s logistics program is delivering talent to a robust transportation industry. Most community college students want to earn a bachelor’s degree (or more) before entering the workforce, so excellent colleges make sure students are well prepared for transfer. It can be difficult to choose from among many four-year institutions, each with dozens of majors, and plot courses accordingly. Prize finalists have taken different approaches to help students transfer smoothly. Broward and Miami Dade have developed close relationships with two nearby universities, Florida Atlantic and Florida International, that have a longstanding commitment to admitting and graduating transfer students. Strong program maps and guaranteed preferential admission, as well as strategic advising—including university advisors meeting with students at the community colleges—combine to foster strong rates of transfer and bachelor’s degree attainment. Community colleges struggle to keep students enrolled due in part to their complicated lives. Palo Alto educates students in a very different context: Transfer students choose from, among other options, seven nearby colleges and universities, each independently governed. The college has had to build different program maps for different majors at different universities, 250 in all. One destination may count 60 community college credits toward a particular major, while another may accept only 42. This means that for some students, it makes sense to transfer before accumulating too many community college credits and an associate’s degree. So even though it’s common practice to counsel students to earn their associate’s degree before transfer, Palo Alto advisors help students understand that there may be advantages to transferring without an associate’s degree – then work to ensure that students retroactively receive the associate’s through a reverse transfer arrangement. The result: Over 50 percent of Palo Alto’s transfer students complete a bachelor’s, well above the national average of 42 percent. At Indian River the nearest four-year campus is 60 miles away. So the college has built 17 of its own bachelor’s degree programs, more than any other Aspen Prize finalist, and aligned those programs to regional job opportunities in high-demand fields. As a result, Indian River has the highest level of bachelor’s attainment among finalists. Community colleges struggle to keep students enrolled due in part to their complicated lives: full-time jobs, families to care for, rising housing and transportation costs, a fraying social safety net. Imagine the retention challenge, then, when jobs paying $50,000 a year are available without a college degree. Such is the case at Odessa, where lucrative work in the oil fields—and plentiful service and retail jobs that cascade from the oil economy—have for decades drawn students away from community college, even in the middle of a semester. That wouldn’t necessarily be a problem if those jobs existed in perpetuity, but the fluctuations of the industry make that a risky bet. The college has responded by giving students every reason to stay. A remarkably effective process to train faculty to engage deeply with students has contributed to an unparalleled 96 percent course completion rate. San Jacinto has found an effective approach to professional development by training permanent department chairs to coach faculty on improving student connection and retention. It’s one thing to adopt reforms that have been proven to work elsewhere. It’s another to do so at scale. 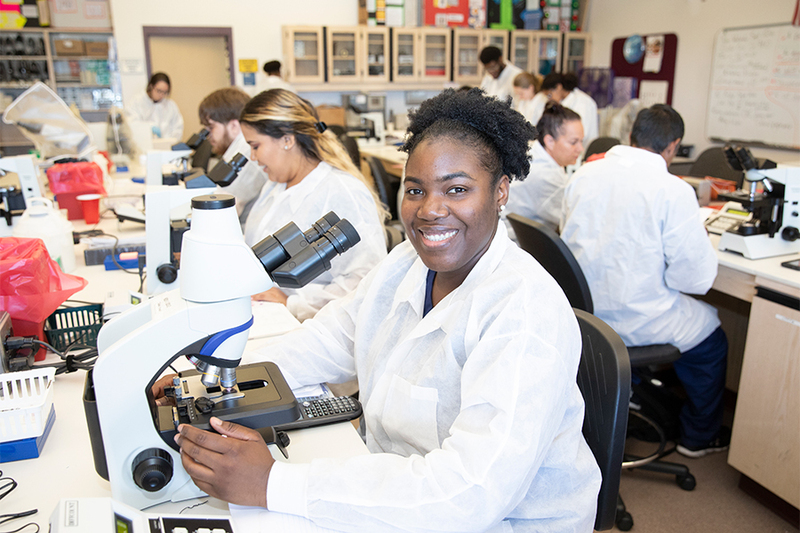 At Pierce College and Pasadena City College in California, many classroom improvements are centered on equity and inclusion. Pasadena administrators and faculty, concerned over disparities in student success rates by race and ethnicity, have developed a culture and professional development systems that support faculty in examining achievement gaps in their classrooms and redesigning course content and pedagogy through a cultural competency lens. At Pierce, the professional development and promotion structure rewards faculty for training in effective teaching practices and testing out innovations in their classrooms and measuring the results. At both colleges, teaching candidates are assessed for their commitment to equity. Achieving high and improving levels of student success requires institutional leaders and practitioners to have a clear idea of what they are trying to accomplish in their particular context. It’s one thing to adopt reforms that have been proven to work elsewhere. It’s another to do so at scale, rather than merely through pilots that only help a small number of students. That sets apart excellent colleges like the 10 2019 Aspen Prize finalists, enabling them to develop reforms that work for all students. In the end, what allows those smart reforms to be scaled and last is an unwavering commitment to understanding the precise needs of their students and their communities, and using that knowledge to build reforms truly likely to help students succeed—both while in college and after they leave. Congratulations to this year’s Aspen Prize finalists, each of whom proves that community colleges deeply connected to their students and communities have the power to build a better future.